The Piraeus Bank Group Cultural Foundation (PIOP), in collaboration with the Goethe-Institut Athen and «Anemon Productions», will present the exhibition «A Balkan Tale/ Μια βαλκανική ιστορία» in the Network of its museums. The exhibition will travel throughout Greece, from Thrace to the Pelonnese and from Thessaly to the islands of the Aegean, starting off at the Silk Museum in Soufli (Thrace). The exhibition offers opportunities for a public dialogue on the shared history of the Balkans, while simultaneously contributing to the showcasing and promotion of the region’s cultural heritage. It presents fifty important monuments built during the period of Ottoman Rule in the Balkans – public baths, aqueducts, churches, mosques, bridges, poorhouses, houses and villas -, as immortalized by the lens of five renowned photographers from Athens, Belgrade, Skopje, Tirana and Prizren. The Ottoman presence in the Balkans lasted from the 14th through to the 20th century. The Ottoman Empire has been equated to a cultural «retrogression» and has been considered by the people of the Balkans as an «undesired heritage». Today, the memory of this period remains hidden in buildings whose use has changed. In whatever form, though, ruinous or rehabilitated, the buildings of the Ottoman period (public and private, Christian, Muslim and Jewish) constitute proof of a common history. It is the history shared by the people of the Balkans for close to six centuries. The exhibition’s photographs invite the visitor to look beyond national borders, by probing the history of the Balkans in its entirety. This is aided by the accompanying texts- with information about the monuments’ construction, use and history-, and by the documentary «Forgotten Balkans», written and directed by Andreas Apostolidis, which is based on the first photographs and films of the region’s different people and is being shown during the exhibition. 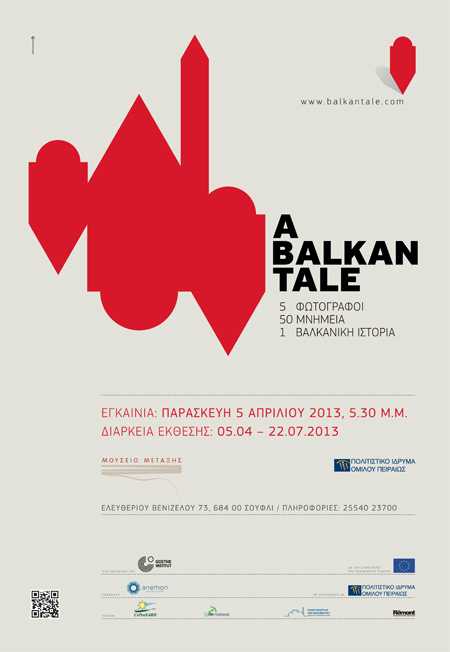 The exhibition «A Balkan Tale/ Μια βαλκανική ιστορία» will be hosted by the Silk Museum from April 5 through to July 22, 2013.